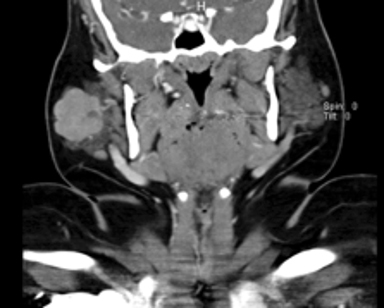 A 26-year-old Caucasian woman presented to the hospital with clinical concern for a parotid abscess. The patient reported that she had right facial swelling for years, which had recently worsened. 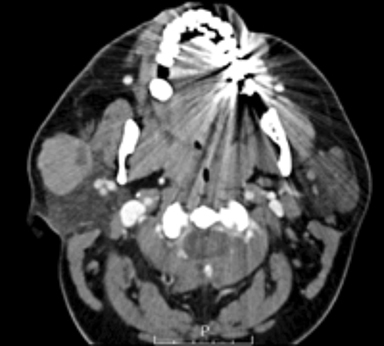 Neck CT with intravenous contrast was then performed, which demonstrated a right parotid mass. No abscess was present. Ultrasound-guided biopsy was then performed, yielding a diagnosis of parotid acinic cell carcinoma. Contrast-enhanced CT demonstrated the presence of a well-circumscribed, lobulated enhancing mass within the superficial right parotid gland. The mass is relatively homogeneous with some cystic components (Figure 1). Parotid acinic cell carcinoma is a rare, slow-growing, malignant tumor with imaging findings indistinguishable from other parotid tumors. It is the third-most common malignant tumor of the parotid gland. Al-Zaher N et al: Acinic cell carcinoma of the salivary glands: a literature review. Hematol Oncol Stem Cell Ther. 2009; 2(1):259-264. Li J et al: Ultrasound and computed tomography features of primary acinic cell carcinoma in the parotid gland: a retrospective study. Eur J Radiol. 2014; 83(7):1152-1156. Lima RA et al: Clinical prognostic factors in malignant parotid gland tumors. Otolaryngol Head Neck Surg. 2005; 133(5):702-708. Yaldoo B, Jaber M. Parotid acinic cell carcinoma. Appl Radiol. 2019;48(2):36. Prepared by Dr. Yaldoo while a Diagnostic Radiology Resident, and Dr. Jaber while an Interventional Radiologist, at McLaren Oakland Hospital in Pontiac, MI.